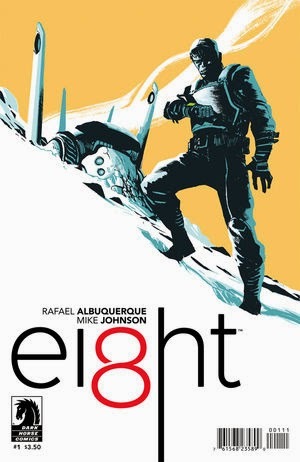 The Fellowship was fortunate enough to obtain a copy of EI8HT #1 from Dark Horse Comics. Mike Johnson writes, with art and story by Rafael Albuquerque. Joshua’s memory has been scrambled by his journey. He remembers that he needs something badly, and he’ll do anything to get it. In exchange for what he wants, he agrees to travel in time seeking a man. That journey is what scrambled his memory, but he thinks he might not be in the right place. Or time. Joshua may be very confused, but he’s also very driven, almost desperate. There aren’t many hints about what he wants (and I don’t want to spoil it anyway), but it’s something that upsets him greatly. The world he finds is very different than his (or ours), which just adds to his disorientation. His quest to complete his mission will make for a cool story, and the art is captivating – his use of detail (and sometimes the creative lack of it) really adds to the sense of other that Joshua feels. A first issue that gives us more questions than it answers is always a good start. I can’t wait to learn who Joshua is and what he cares about so deeply. EI8HT #1 is available now at your FLCS or at darkhorse.com.